Thanks to Honestly Austin for this great review. You can read the whole review at https://honestlyausten.wordpress.com/2018/05/07/yellow-river-pledge-review/. This entry was posted in Uncategorized on May 19, 2018 by britbear. Hi everyone! 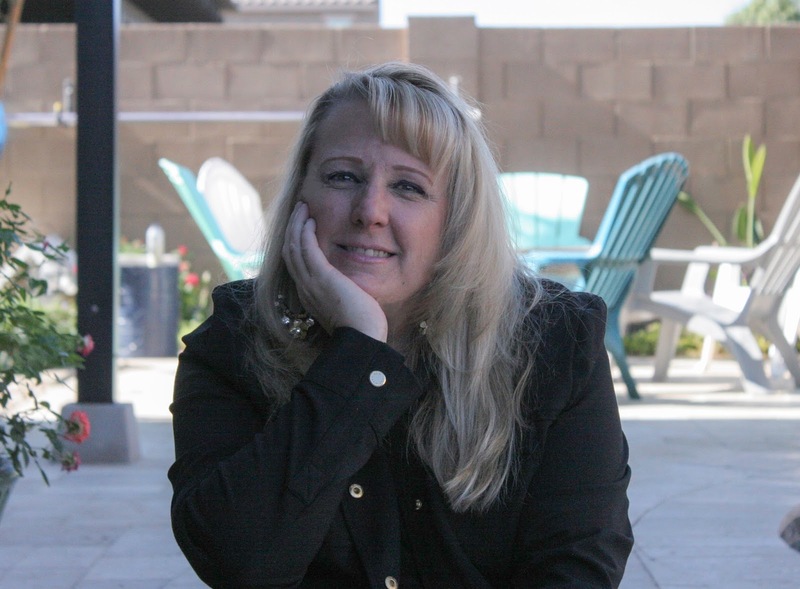 Angela Carling here, writer of sweet romance and award-winning paranormal suspense. Thanks for dropping in. 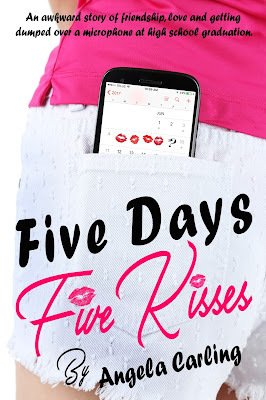 I’m so excited to tell you about my latest book, Five Days, Five Kisses and three best friends that you’ll want to hang out with long after you’ve finished the book. Their names are Nikola, Maya, and Liberty. Eventually each girl will have their own book, but Five Days Five Kisses is Nikola’s story and it’s all about the awkwardness of a bad breakup. If you read on, you’ll learn about my worst break up. Do you like the cover? It was custom made by a very talented cover artist that I will definitely use again for the other two books! I love how it captures the vibe of this fun feel-good romance! Where can you pick up your copy? Here’s the links to grab your copy for .99 only until Valentines Day then the price goes up! If you want to keep with my new releases and books that go on sale or are FREE, join my newsletter. Now about my break up story…. When Nikola’s boyfriend dumped her in such public way it was easy for me to relate to her confusion and embarrassment. Fresh out of high school, I stood in her shoes, minus that microphone and the entire graduating class. My sweetheart of two years had gone on vacation with his family. I usually went with them, but had to work. They were camping(and it was the late 80’s with no cell phones, so I didn’t worry when my boyfriend Mickey didn’t call for a couple of days), but after five days of silence, I worried that something had happened to him. The following morning I got in my car and drove three and a half hours San Diego, California. It was a gorgeous day and I found their beach campsite with no problem. Sitting on the sand, I waited for Mickey to come out of his tent. Forty five minutes, then two hours and finally three hours went by. Ah, the patience of young, stupid love. Finally, his mom came out and told me that the relationship was over! Yep, it was that brutal, dissed by your boyfriend’s mother. Hold on, it actually gets more awkward. The next night I didn’t sleep. How could I? The love of my life had changed overnight. Surely he was having a moment of insanity and had just forgotten his undying love for me. I was such a teenager, full of drama! So I did what any love struck teen would do who was full of optimism and longing, I drove to San Diego again and waited on the same beach. Now looking back, my boyfriend who hated conflict must’ve struggled for hours watching me, knowing he had to face me! Haha, it kind of makes me laugh. Finally, he showed up. Looking hung over and very uncomfortable he came to me and confirmed that he was breaking up with me. No warning signs, no fight. It was just over. To me, the funny part of this story came later when I arrived home to my Dad. I was raised by a single father who had to be both mom and dad. He is a good man, but at that moment, he was very uncomfortable with his role. As he watched an endless trail of tears stream down my face, he said, “I’m sorry honey. I know you….’ He paused struggling to say the word that no father wants to think about let alone say to his daughter. Then he said, “Llloved” him sounding like the word itself might choke him to speak aloud. It was kind of wretched, but somehow made me smile through my sorrow. After a couple of months of playing the field, Mickey came to me wanting to get back together. Fool me once…and all that. So there it is, my oh-so embarassing break up story and maybe somewhere in the back of my mind, the inspiration for Nikola’s gut-wrenching day that led her straight into the arms of five strangers…or so she thought. What’s the most awkward romantic moment that you’ve ever experienced? Tell us about it! And I hope you love Five Days Five Kisses! This entry was posted in Uncategorized on February 1, 2018 by britbear. What do you think of when you think of Stephen King? So how would you feel if Stephen King came out with a sweet romance or Nicolas Sparks waded into the pool of science fiction, or Harlan Coban brought forth a straight-up comedy? Yeah. Most authors don’t do that. To be fair, that isn’t always true. Stephen King is actually a good example. He usually writes horror, sure, but he has written some dramas without horror or supernatural elements as well. C. S. Lewis is one of the best examples I know. He wrote a little of everything, from science-fiction to fantasy to scholarly works to Christian theology for the common man to poetry. They usually picked the genre because there’s something about it they especially like. People are used to it, and might not buy something they wrote if it was different. Me, my primary genre is science-fiction. I’d say eighty-five percent of my work probably falls into that category. But there are plenty of exceptions. My western mystery novel, Never. Numerous short stories and poetry. And my latest novel, October. October is my first novel to leave the realm of so-called “genre fiction” and venture into the much more murky territory of “literary/general/contemporary/drama” fiction. There’s no crime. No technological advances. Nothing supernatural, at least, no more so than in our own everyday lives. Just people. Living. Loving. Learning. Heartbreak, joy, wonder. Relationships. Trouble. Feelings. Personally, I just don’t start out thinking along the lines of genre. I think of a story—usually relationship-based—and once I have that I ask myself what setting lends itself best to this story. Usually, there’s a clear answer. Some stories are just begging to be science-fiction or historical or what-not. But not October. October, by its very nature, demanded general fiction status. Ultimately, I try to ensure that every choice I make in writing is in service to the story, to the theme, to what I want to tell the world. If that ends up being sci-fi, I’m happy. It is still my favorite genre. But sometimes a story wants to be something simpler. Something closer to home. Something more true-to-life. This entry was posted in Uncategorized on October 27, 2017 by britbear. Please join Britbear’s Book Reviews in welcoming author of The Key, Secret Defenders Book 1, Felicia Rogers with a guest blog post. A contemporary YA paranormal romance. Buy The Secret Defenders Book 1: The Key on Amazon, Barnes & Noble, and Smashwords. Maddie Clevenger is alone. Her parents have died and she doesn’t seem to fit in anywhere. Coal Creek High is no different. Two months into school and she still doesn’t have a locker. She is basically invisible, at least until two new kids show up. Dougal and Chase are as different as night and day. They are like two sides of the same coin. One dark, handsome, and mysterious and the other light, handsome, and well, mysterious. But you have to understand, Maddie Clevenger isn’t just some random girl without a purpose. She isn’t the class dork as she believes. No, she has a purpose. A purpose that has been passed down. A burden she must bear. The question is, how will she handle it? “What’s wrong with you?” asked Stephanie. “That’s him,” whispered Marley, loud enough for everyone in the room to hear. “The other new guy.” Stephanie groaned. Maddie would’ve smiled if she hadn’t been distracted, but Dougal sat in her seat again. She stiffened as she prepared to approach. Grateful, she shook her head. This entry was posted in Uncategorized on October 25, 2015 by britbear. Britbear’s Book Reviews welcomes author Marianne Sciucco, author of today’s guest post (originally published at http://mariannesciucco.blogspot.ca/2015/06/beyond-still-alice-5-alzheimers-books.html on 1 Jun 15. This is not just our parents’ disease. It’s a problem that has far-reaching complications, not only wreaking havoc in the life of the one afflicted, but in the lives of all those surrounding him or her: spouse, children, grandchildren, siblings, friends, caregivers, and the greater community. Its impact is exponential: For each one of the 5.3 million Americans diagnosed with Alzheimer’s, there are another 5.3 million (at the very least) affected (see Alz.org). These people are our families, neighbors, co-workers, friends, and acquaintances. As our lives intersect and intertwine, this disease affects all of us. June is Alzheimer’s and Brain Awareness Month. Take some time to learn more about this illness, to understand what it means to those who love someone afflicted, to those who dedicate themselves to see that they are cared for, and ensure that their lives continue to have meaning and dignity. There are many ways to become educated about a condition or disease. With Alzheimer’s, there are hundreds of books available to explain it, advise what to do about it, how to handle it, and offer solutions and support for caregivers. These are excellent resources. Here are five titles to get you started. Three are memoirs, two are novels. Two are written by women who did double duty at the same time, caring for both mother and father as they suffered from dementia and Alzheimer’s. Another is the story of a woman healing her relationship with her mother after an Alzheimer’s diagnosis. One is written by a novelist wanting to pay tribute to those who rise to the difficult challenge of serving as caregiver to a loved one with this disease. One is written by a nurse who worked with hundreds of Alzheimer’s patient and their families. Navigating the waters of dementia can be frightening, unleashing a myriad of emotions for everyone involved, precipitating anxiety and grief, anger and frustration, extreme sadness and feelings of hopelessness. After Vicki Tapia’s mother was diagnosed with Alzheimer’s disease, followed closely by her father with Parkinson’s disease-related dementia, she struggled to find practical, helpful information to light her way. Somebody Stole My Iron began as a diary to help her cope but emerged as a road map for others. It offers a glimpse into her family’s life as they rode the waves of dementia, sometimes sailing, other times capsizing. This engaging memoir offers useful information from experts in the field of Alzheimer’s research, personal lessons the author learned along the way, and ideas/tips for managing the day-to-day ups and downs of dementia. Somebody Stole My Iron chronicles the tenacity of Vicki’s mother as she fought her way through the tangled and bewildering labyrinth called dementia. Above all, it is a story of holding on and ultimately learning to let go, transcending the pain and turmoil to discover both an abiding love and a tender compassion. A nursing facility is everyone’s solution for what to do about Sara, but her husband, Jack, can’t bear to live without her. He is committed to saving his marriage, his wife, and their life together from the devastation of Alzheimer’s disease. He and Sara retired years ago to the house of their dreams and operated it as a Cape Cod bed and breakfast named Blue Hydrangeas. This entry was posted in Uncategorized on June 21, 2015 by britbear.